Richard Roblin is an internationally recognized artistic master. He consistently and passionately has pursued his artistic vision while remaining true to the deepest impulses of his soul. Richard has quietly and steadfastly developed his coterie of collectors who have been excited and inspired by his creativity. Richard's journey as an artist has taken him throughout North America, Europe, the Orient, and India. He has imbibed the teachings of many cultures. 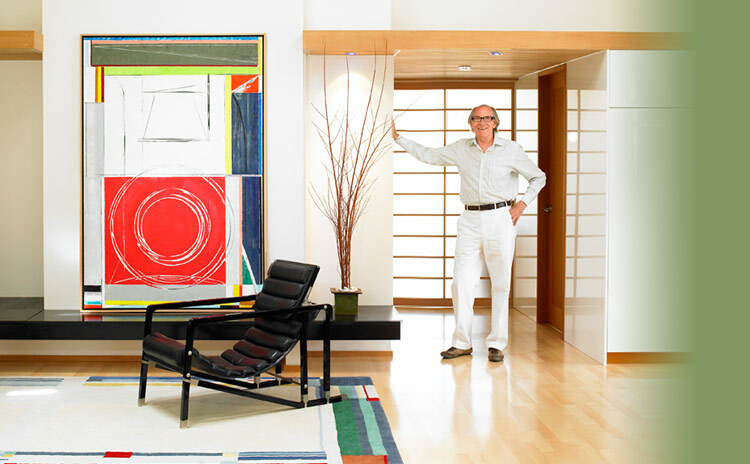 His passion for creativity extends through his practice of architecture, design, sculpture and painting. Roblin's works are exhibited and collected widely through commercial galleries and museums, including the Museum of Modern Art in New York. Throughout his career, he has collaborated with architects and designers to provide site-specific artworks. He continues to do major commissions for corporate and private collectors. "I love to paint", Roblin says. "The nature of my painting activities is to engage with the magical resonances of colour and form. I play with the dynamics of luminosity to reveal the sense of joy which inspires it. My process of painting is to begin by drawing with colour, a line or shape. Everything that emerges is defined by that primary impulse which is like the leap of a dancer onto life's stage. Suddenly, the canvas begins to light up. Each canvas is an open door, a dance circle, a symphony of breath breathing its life through the action of the artist. Each artist, an understudy of creation itself, re-enacts the birth of the universe."